Mindful of law No 92/006 of 14 August 1992 and of its decree of implementation No 92/455/PM of November 1992. In accordance with the Ministry of Women’s Empowerment and the Family’s mission to improve the status of the Cameroonian woman and that of the girl child. A non—profit organization, non political foundation abbreviated AMEF was created in the year 2006 and legalized in 2008. AMEF covers the South West Region of Cameroon and Beyond. The AMEF nursery/primary school is ongoing with a small increase in the number of children coming to school. The fencing of the AMEF facility as a safe guarding measure. Putting in place and launching of a demonstration poultry farm with a total of 150 birds for economic empowerment of women and youths. 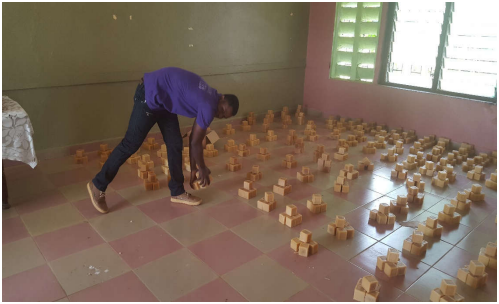 The putting in place of the AMEF ACTIVE-FINGERS INITAITIVE to build capacity of women and youths through waste paper recycling and urban agriculture. Humanitarian Assistance in the form of shelter, basic needs and clothing to over 100 internally displaced persons (IDP’s) victims of the internal crisis in Meme Division. Initiating a radio program, were the different program heads share with the public, what they are doing and what is up coming. Since December 2017, AMEF re-oriented its operations in the South West Region of Cameroon due to the increasing needs of people displaced by the Internal Crisis between the State armed groups and non-state armed groups. This crisis, has shattered communities and driven over 135 million people from their homes. Six months into reaching out to displaced population, AMEF has taken a global approach and commitment to assist internally displaced people survive and re-establish themselves through: Food items & Livelihood, - Education, -Protection (child friendly space), - Health, - Non-food items (NFI), - Counselling, - Hygiene & Sanitation promotion. For a full knowledge of the great humanitarian work done so far, CLICK HERE to view and read more. Discipline, Transformation, Gender Equality /Equity, Development and Peace. To see children (esp. the girl child) transformed to responsible citizens and women and youths integrated in all areas of development. Act holistically in a concrete and ethical manner to promote the effective integration of children (esp. the girl child), youths and women in the process of development. To support the development of children and youths esp. the girl child, empower women to be agents of change in their communities through formal and non formal education.